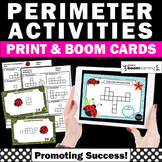 Also included in: Ultimate Christmas Bundle: Social Studies, Reading, Writing and Math! 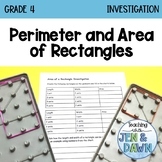 Worksheet/assessment includes 6 problems - 2 perimeter of a rectangle, 2 perimeter of a square with 1 side measurement given, 2 perimeter when given the perimeter and one measurement All answer choices are designed to be gridded on a griddable that includes 2 places behind the decimal. Halloween Math: Perimeter, Area, and Volume! Attach grid paper to this and have your students use perimeter to draw a floorplan of their very own dream house! 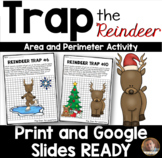 Students will create a backyard based on the various perimeter measurements that are given to them. They have can be creative and add their own personal touch to it. This file contains questions that connect to the common core standards for third grade in the MD standard. Just in time for Valentine's Day! Perfect activity to practice perimeter and area with conversation hearts! Give each student a box of small candy hearts!